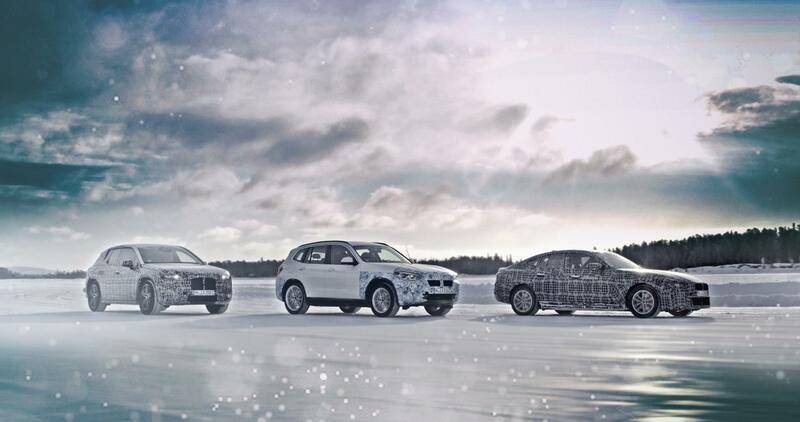 BMW iX3, iNext and i4 prototypes are undergoing extreme weather testing in northern Sweden. The Arctic Circle lately has been the mailing address for a group of engineers assigned to the new BMW EVs. The automaker is subjecting the new iX3 “activity vehicle,” i4 sport sedan and iNext crossover to extreme cold testing at its facility in Arjeplog, Sweden. The electric vehicles’ motors and high-voltage batteries, as well as the suspension control systems and BMW eDrive power electronics, are being evaluated for ability to perform in frigid temperatures and wet and icy conditions. BMW says all three models will use the company’s 5th generation electric drive technology, which will debut on the iX3. The system combines the electric motor, single-speed transmission and power electronics in a single, compact unit and places the battery cells in a compartment beneath the vehicle floor. Multiple motors can be used to achieve all-wheel drive and battery packs can be configured in different capacities to permit short, medium and long-range versions of the same model. BMW has said that all-electric vehicles using the Gen-5 “eDrive” system will be able to deliver up to 435 miles of range per the new European “WLTP” testing system. Range ratings for electric vehicles likely will be somewhat less in the U.S. under EPA test procedures. BMW says the new eDrive can be used both for all-electric vehicles and for plug-in hybrids. It will enable PHEVs to achieve up to 62 miles or all-electric range per the WLTP ratings system. The iX3 “sport activity vehicle” will be capable of delivering close to 250 miles of range on the new European test cycle. It will be the first BWM model produced for the global market in China, at the BMW Brilliance Automotive Joint Venture in Shenyang. The four-door i4 sporty sedan will deliver more than 370 miles of range on the WLTP cycle. It will boast 0-62 mph acceleration of 4 seconds and a top speed in excess of 125 mph, the company said. The iNext crossover also will be a long-range model with more than 370 miles of range per European testing. It will feature an array of components that can deliver Level 3 autonomous driving when permissible. Level 3 is defined as “conditional automation” in which a driver still must be present and ready to take control if needed, but does not have to continually monitor external conditions. A Level 3 vehicle likely would not be able to operate autonomously in all situations – such as entering and exiting highways. Both the i4 and iNext will be built in Germany.